If your credit card debt is getting out of control, you may want to consider debt consolidation. This involves borrowing money and paying down your credit card debt. If possible, you want to have a single payment each month rather than multiple credit card bills. The tricky part is deciding where you will borrow the money from and if they will approve you for a loan. There are lots of ways to consolidate debt. You just have to find the right method for you. If you are drowning in debt, it’s time to consider consolidation. Here are some ways you can get the cash you need to consolidate your debt. Credit counseling services help people develop a plan to pay down their debt. Be sure to choose a nationally credited organization if you are choosing this route. They may be able to help you set up a debt management plan. This often involves you paying a monthly payment to the credit counseling organization, and they, in turn, pay your creditors. They can often negotiate lower monthly payments or interest rates for you. Some credit counseling companies require a setup fee. Some creditors may require you to close out your account with them when you pay off the balance. This can sometimes affect your credit rating. 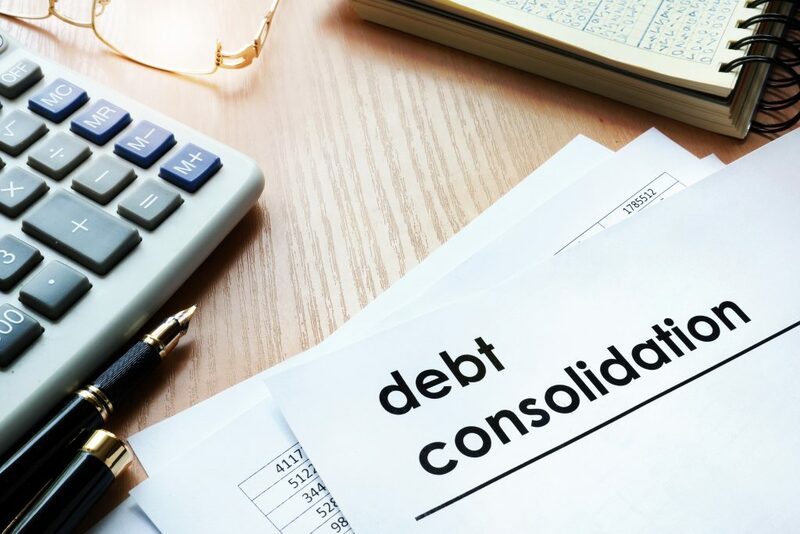 Learn more about the pros and cons of debt consolidation. This type of card is interest-free for a promotional period of 12 to 18 months. This allows you to transfer your other credit card balances to the interest-free card. To qualify for most balance transfer cards you need a credit score above 690. The goal is for you to pay off your credit card debt during the promotional period. After the promotion time is up, you will pay the regular interest rate on the card. Some card companies charge a balance transfer fee of three percent of the amount you transfer. You can apply for a personal loan from a bank, credit union, and online lenders. You can use a personal loan to help you consolidate your debt. You want a loan that offers a lower interest rate than you are paying now. With a personal loan, you can pay off your debt over a few years. An origination fee may apply. This can be costly if you are heavy in debt. Smaller institutions like credit unions are more likely to approve a personal loan with good terms even if you have less than perfect credit. Homeowners can take out a loan or a line of credit on their home’s equity. Home equity loans have a fixed interest rate. A line of credit is more like a credit card that has a variable interest rate. These are secured loans, and you may be able to write off the mortgage interest payments on your taxes. Borrowing against your home is risky though. Your home is the collateral, and if you don’t make your payments, you could lose your home to foreclosure. If you have a retirement account such as an IRA or a 401(k), you can borrow or withdraw funds to pay your credit card debt. This is your money, so there’s no credit check to withdraw money from a retirement account. You may want to use this option as a last resort. Borrowing from your nest egg lowers your future retirement savings, and you may have to pay additional taxes and a withdrawal penalty. If you are drowning in credit card debt and you’ve exhausted other options, you could try asking a trusted family member or friend for a loan. They may offer you a lower interest rate than any financial institution would. Be cautious before borrowing money from someone you know. You could put your relationship at risk if you’re unable to make your payments. If you go this route, be sure to have a plan in place for repayment. If your credit is less than ideal, a bank or credit union may turn you down for a personal loan. In this situation, a cosigner can help by applying for a personal loan with you. The lending institution considers the cosigners income and credit in addition to yours. The cosigner is responsible for making the loan payments if you fail to do so. Cosigners take a big risk, and many people refuse to cosign a loan for anyone. If you have someone who is generous enough to cosign a loan, you may be able to get more favorable terms. When you apply for more than one loan, it can affect your credit score. Each time you apply, a lender checks your credit rating. Multiple inquiries can lead to a lower credit score. If you apply for more than one loan, try to do so within a short time frame to avoid this possibility. Steer clear of lenders who claim to approve everyone regardless of credit scores. No reputable lender will give you a loan without first doing a credit check. When you apply for a loan, you give out sensitive information like your date of birth and social security number. Make sure the lender is reputable before you hand over this personal information. Watch out for lenders that require large fees and service charges. A loan from a reputable financial institution is always best. Once you have your loan, pay off your credit card debt as soon as possible. To get out of debt, you must stick to the plan. Once you have paid off your credit card bills, avoid getting back into debt. You don’t want to end up in the same situation again. You will love the peace of mind you will have when you are debt-free. The first step is to consolidate your debt. For more financial advice and helpful tips, be sure to check out our website.